Various earth orbits to scale; green dash-dot line is medium earth orbit, a typical GPS orbit. Note: This animation does not reflect actual orbits which are approximately 350 times denser than these. The GPS satellites circle the Earth at an altitude of about 20,000 km (12,427 miles) and complete two full orbits every day. A Navstar GPS satellite undergoing pre-launch testing. Rockwell International was awarded a contract in 1974 to build the first eight Block I satellites. In 1978 the contract was extended to build an additional three Block I satellites. Beginning with Navstar 1 in 1978, ten "Block I" GPS satellites were successfully launched. One satellite, "Navstar 7", was lost due to an unsuccessful launch on 18 December 1981. The Block I satellites were launched from Vandenberg Air Force Base using Atlas rockets that were converted intercontinental ballistic missiles. The satellites were built by Rockwell International at the same plant in Seal Beach, CA where the S-II second stages of the Saturn V rockets had been built. The Block I series consisted of the concept validation satellites and reflected various stages of system development. Lessons learned from the 11 satellites in the series were incorporated into the fully operational Block II series. Dual solar arrays supplied over 400 watts of power, charging NiCd batteries for operations in Earth's shadow. S-band communications were used for control and telemetry, while a UHF channel provided cross-links between spacecraft. A hydrazine propulsion system was used for orbital correction. The payload included two L-band navigation signals at 1575.42 MHz (L1) and 1227.60 MHz (L2). The final Block I launch was conducted on 9 October 1985, but the last Block I satellite was not taken out of service until 18 November 1995, well past its 5-year design life. The Block II satellites were the first full scale operational GPS satellites, designed to provide 14 days of operation without any contact from the control segment. The prime contractor was Rockwell International, which built a SVN 12 qualification vehicle after an amendment to the Block I contract. In 1983 the company was awarded an additional contract to build 28 Block II/IIA satellites. Block II spacecraft were 3-axis stabilized, with ground pointing using reaction wheels. Two solar arrays supplied 710 watts of power, while S band communications were used for control and telemetry. A UHF channel was used for cross-links between spacecraft. A hydrazine propulsion system was used for orbital correction. The payload included two L band navigation signals at 1575.42 MHz (L1) and 1227.60 MHz (L2). Each spacecraft carried 2 rubidium and 2 cesium clocks, as well as nuclear detonation detection sensors, leading to a mass of 1,660 kilograms (3,660 lb). The first of the nine satellites in the initial Block II series was launched February 14, 1989; the last was launched October 1, 1990. The final satellite of the series to be taken out of service was decommissioned on March 15, 2007, well past its 7.5 year design life. Nineteen satellites in the Block IIA series were launched, the first on November 26, 1990 and the last on November 6, 1997. Only one satellite of the Block IIA (SVN-34) is still in service, broadcasting the PRN 18 signal. Two of the satellites in this series, numbers 35 and 36, are equipped with laser retro-reflectors, allowing them to be tracked independently of their radio signals, providing unambiguous separation of clock and ephemeris errors. Artist's impression of a GPS-IIR satellite in orbit. The Block IIR series are "replenishment" (replacement) satellites developed by Lockheed Martin. Each satellite weighs 4,480 pounds (2,030 kg) at launch and 2,370 pounds (1,080 kg) once on orbit. The first attempted launch of a Block IIR satellite failed on January 17, 1997 when the Delta II rocket exploded 12 seconds into flight. The first successful launch was on July 23, 1997. Twelve satellites in the series were successfully launched. At least ten satellites in this block carried an experimental S-band payload for search and rescue, known as Distress Alerting Satellite System. 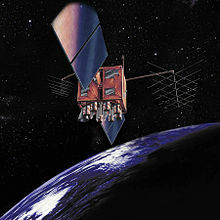 Artist's impression of a GPS-IIRM satellite in orbit. The Block IIR-M satellites include a new military signal and a more robust civil signal, known as L2C. There are eight satellites in the Block IIR-M series, which were built by Lockheed Martin. 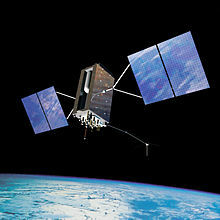 The first Block IIR-M satellite was launched on September 26, 2005. The final launch of a IIR-M was on August 17, 2009. Artist's impression of a Navstar-2F satellite in orbit. The Block IIF series are "follow-on" satellites developed by Boeing. The satellite has a mass of 1,630 kilograms (3,600 lb) and a design life of 12 years. The first Block IIF space vehicle was launched in May 2010 on a Delta IV rocket. The twelfth and final IIF launch was February 5, 2016. Artist's impression of a GPS Block IIIA satellite in orbit. GPS Block IIIA is the first series of third-generation GPS satellites, incorporating new signals and broadcasting at higher power levels. In September 2016, the Air Force awarded Lockheed Martin a contract option for two more Block IIIA satellites, setting the total number of GPS IIIA satellites to ten. On December 23, 2018, the first GPS III satellite was launched aboard a SpaceX Falcon 9. The Block IIIF series (or "tranche") is the second set of GPS Block III satellites, which will consist of up to 22 space vehicles. Block IIIF launches are expected to begin no earlier than 2025 and continue through 2034. ^ "Navstar 1". NASA. 27 April 2016. Retrieved 25 July 2016. ^ "The Global Positioning System". harvard.edu. ^ "BLOCK I SATELLITE INFORMATION". USNO. ^ "Site: Boeing North American, Inc". WTEC. ^ "BLOCK II SATELLITE INFORMATION". USNO. ^ "GPS CONSTELLATION STATUS". U.S. Coast Guard Navigation Center. Retrieved 28 October 2018. ^ "CDDIS Bulletin - June 1994, Volume 9 No. 5". NASA Goddard Space Flight Center. Archived from the original on 2009-03-20. ^ "Global Positioning management System IIR". Lockheed Martin Space Systems Company. ^ "GLOBAL POSITIONING SYSTEM". USAF. Archived from the original on 2007-11-16. ^ "Latest GPS IIR-M Sat Goes "Gold" For Lockheed Martin". SatNews. Archived from the original on 2008-01-23. ^ "Air Force successfully launches GPS IIF-12 satellite". GPS World. February 8, 2016. ^ "SMC exercises contract options to procure two additional GPS III satellites". September 22, 2016. ^ Divis, Dee Ann (November 22, 2017). "Next Tranche of GPS Satellites to be called GPS IIIFs". Inside GNSS. Gibbons Media & Research LLC. Retrieved December 1, 2017. ^ Gleckel, Gerry (November 15, 2017). "GPS Status & Modernization Program" (PDF). GPS.gov. U.S. Air Force. Retrieved December 1, 2017.